Just ran across This Is Colossal‘s report on the Polish pianist Slawomir Zubrzycki’s realization of one of tne wildly imaginative hybrids Leonardo da Vinci dreamed up in his notebooks. Sketches for this “viola organista” – a mating of the principles of stringed and keyboard instruments – are found in da Vinci’s massive collection of sketches known as the Codex Atlanticus. Almost a hundred years [after the da Vinci sketches] in 1575, church organist Hans Hyden of Nuremberg created the first functional bowed keyboard instrument operated by a foot-treadle. He used gut strings (later switched to metal when the gut strings failed to say in tune) and five or six parchment-wrapped wheels which, when turned by the treadle and a hand-crank at the far end operated by a helper, would be drawn against individual strings determined by which keys were played. Hyden claimed his instrument could produce crescendos, diminuendos, vibrato and sustain notes indefinitely solely through finger pressure on the keys. He even said it could duplicate the voice of a drunk man. He called it a Geigenwerk (meaning “fiddle organ”) which is the German translation of da Vinci’s name for it, but although some sources imply or claim he based his design on da Vinci’s, I have serious doubts about that. Leonardo was hugely famous in his lifetime and after, but it was for his art, not his notebooks. Bequeathed to his friend and apprentice Francesco Melzi, the notebooks were sold off piecemeal by the Melzi family after Francesco’s death in 1579. Pages were scattered to courts and collectors all over Europe. Some of Leonardo’s notes on painting were published in 1651, but the bulk of the notebooks only made it into print in the 19th century. I don’t see how Hyden could have had had access to them. None of Hyden’s Geigenwerks — he’s reputed to have built as many as 32 of them although only two are thoroughly documented — have survived. The details of its operation and the sole surviving illustration of the instrument have come down to us from German composer and music theorist Michael Praetorius who included one of Hyden’s original pamphlets describing the machine and a woodcut of it in the appendix to the second volume of his Syntagma Musicum, published as the Theatrum Instrumentorum seu Sciagraphia in 1620. 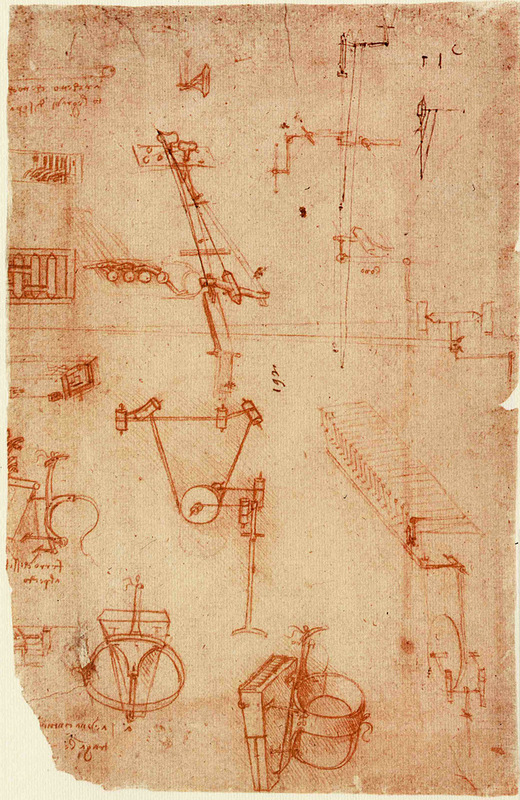 Fascinating post, great to hear more about Da Vinci’s work and the influence it has had.